There are a lot of facial scrubs out there to refresh and exfoliate the skin for a sophisticated and clean look. It’s necessary to find the right one that suits your skin and ensures results for you since many of them introduce different ingredients and performance with only a few factors that are commonly seen. The search for a great facial scrub may carry on for ages for many people, but for now, let’s end yours by introducing the Man Cave facial scrub. 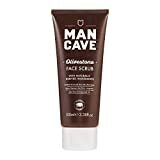 The Men Cave facial scrub comes in a great-looking brown tube that looks almost as if it were wood and the design of the tube goes with the company name. The dark brown, 3.4 oz. tube has white writing on it, and the cap over the tube is transparent. Another noticeable detail about the design of the product is that the area around the face of the tube is used well which makes it look great. One of the things that sets the facial scrub apart is the unique combination of ingredients that it uses. It features fine grains of olive stone powder that helps exfoliate the skin to give it a clean look, while the addition of Horsechestnut keeps the skin from becoming dry by hydrating it well. One common but necessary ingredient that it features is aloe vera as well as the nourishing vitamin E.
The product also features cetyl alcohol, silica, olive seed powder, grapeseed oil, arginine, phenoxyethanol and several ingredients that make for a great blend of modern chemicals with ancient remedies. All of the ingredients used in the mixture are of great quality and they are not extracted from or tested on animals. Most of the organic ingredients are from common herbs used in cleaning the skin and the modern ingredients are chemically engineered to make the perfect mix by using the latest methods. It’s true that the Men Cave face scrub features a lot of unique ingredients, but what does this mean for the users? Aloe vera, L-arginine and Horsechestnut help moisturize the skin, smoothening it and softening it to give a fresh and lively look. There is also the addition of the anti-microbial zinc PCA, which keeps the skin from looking too oily and prevents excess oil production around the skin cells. Although some users complain about it being a little too gritty, the Men Cave face scrub is a great product that ensures results and exfoliates the skin well to give a neat look after shaving. The mix of herbs and chemicals featured in the ingredients is unique in such a way that many ingredients stand out and set the product apart. In conclusion, this product is recommended for almost all types of skin.